I’ve already written about the ubiquity of English around the world and what you, if you’re a native English speaker, can do about it, but I feel there’s more to say about Germany. Germany is a special case. Much like Holland, Finland, and the Scandinavian countries, Germans seem to inhale English like they do beer and potatoes. They just “get” English in a way that many other countries struggle to. Maybe it’s the similarity to their own language (“House” = Haus, “Music” = Musik, “to find” = finden; watch out for false friends, though, like das Gift, which means “poison”), or maybe it’s a more recent affinity for Hollywood TV shows and music, but Germans pick it up quickly. They get more than just the grammar and words, too. They manage figures of speech, colloquialisms, and slang, often without making it sound forced. I’ve exchanged several emails with Germans before realizing they weren’t native English speakers. That said, the above cartoon is definitely an exaggeration. Go to a farmhouse in Bayern (southeastern Germany) and they’re not likely to speak much English. It’s more of an exaggeration, an allegory for the way I feel living here in Berlin. Especially among the younger generation, finding a Berliner who doesn’t speak nearly perfect English would be a difficult task indeed. I recently had dinner with several German friends and had to keep repeating “auf Deutsch!” (“in German!”) every few minutes because they kept habitually switching back to English when speaking to me. Fear not! There is a remedy for this language learner’s headache, however. Late last year I met an Australian woman who spoke excellent (if heavily accented) German. Better yet, Germans spoke German to her! I asked her how she managed this incredible feat. “I don’t speak English to Germans,” she replied. At first this sounded harsh. After all, Germans are just proud of their English, or want to improve it, and relish the opportunity to speak with a native. But I realized it was more about changing your own headspace than being rude or snippy. When we communicate, we naturally want to take the path of least resistance. We search for the language we have in common with the person we’re speaking to, and once found, it’s very hard to change it. That’s why you have to be bullheaded. You have to insist on it, despite the temptation to slip back into your comfortable, familiar mother language, which even the natives of this foreign land can manage so irritatingly well. What about you? Have you lived in or traveled through Germany, Denmark, or Scandinavia, or with someone from those countries? How do you get them to practice their language with you? Hello! I live in small city in West Germany and I have to say that it’s really interesting to read your article! @Stefanie Good thing you have the internet! @Malachi Rempen I study German and would barter English conversation for German conversation. I have a master’s degree in Education and my English is Ausgezeichnet! Ich bin Engländerin, und ich möchte mein Deutsch verbessern! @Charlotte Robinson Hallo, Charlotte. Ich möchte mein Deutsch auch verbessern. Jetzt lerne Ich die Sprache (oder Ich versuche) Aber Ich habe keinen Freund der Deutsch sprechen kann. Es ist sehr schwer mir die Sprache zu üben. @Stefanie Nice cartoon and your article made a lovely read. My experience in Colgone, Germany was quite different especially when it came to strangers. I noticed that if I began a conversation in German (however broken) I always got a response in German itself. In fact Germans more than appreciated me a foreigner taking an effort to talk in their language. Surprisingly, most Germans that I met felt that German is a difficult language to learn. But its true when it came to German friends.. They always spoke in English. It could be my sheer fear of being embarrassed speaking bad German that even I gave in talking to them in English instead. @Stefanie Stefanie. Where about are you? I need a friend in Germany whom I can communicate with in English as I usually fly back and forth to my African continent via Frankfurt most often. It will be great to meet up sometimes. I travel frequently to Sweden, and while I have heard all these stories, it’s never happened to me. Everyone is so pleased that I’ve made the effort to learn Swedish! And they’re very patient. They sometimes switch to English briefly, to explain a concept or to clarify if I’ve used a wrong word (hummer/lobster vs. humlor/bees, in one memorable goof-up). And we sometimes find ourselves speaking a mash-up “Swenglish”, but almost never more than a couple of sentences in English. @Maria That’s very interesting, thanks for sharing. Actually I understand that – I’ve heard Germans tell me that it’s sometimes just faster to speak in English. In German things can get complicated quickly, and there are so many figures of speech and phrases in English that communicate ideas more easily. In fact I do this with my own Italian wife – sometimes we’ll find ourselves speaking English sentences mixed with Italian and German, just because there are faster ways to say certain things in each of those languages than trying to figure out how to say it in English. If both parties understand, what’s the problem? Interesting comic! 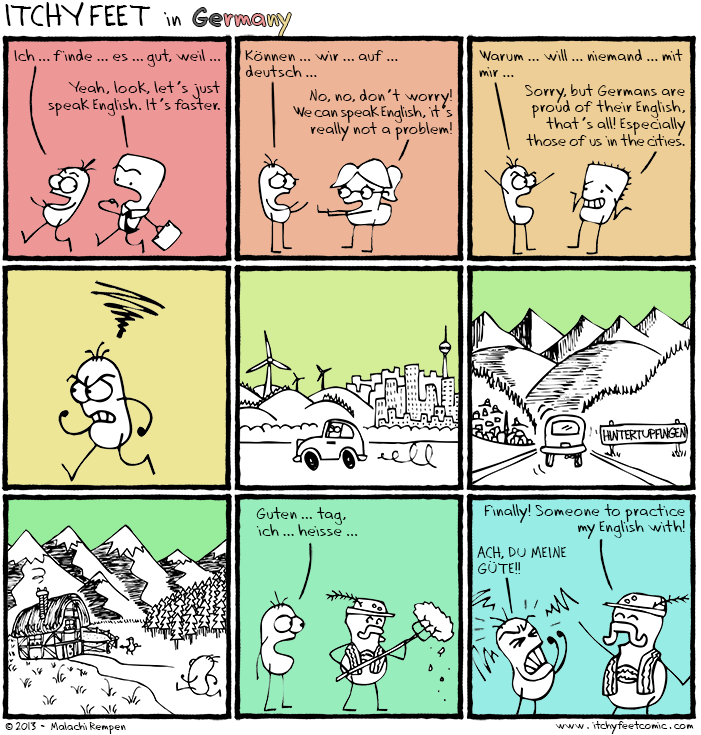 However, I feel it’s really difficult for a non-German speaker (like me) to communicate effectively in Germany. I live in Hamburg & I have lived in Sweden before. With Sweden, I have seen that everyone (literally everyone) spoke excellent English. Although I learnt Basic Swedish pretty easily, I never ever had to use it with Swedes. However, in Hamburg, I’ve had many embarrassing moments, wherein the other person has no idea what I am trying to say, when I speak English. I found many Germans quite hesitant to speak English, although they are good at it. @Sagar Sridhara That’s definitely true. They’ll say “no, I don’t speak very good English” … in perfect English. @Malachi Rempen Nice cartoon and your article made a lovely read. My experience in Colgone, Germany was quite different especially when it came to strangers. I noticed that if I began a conversation in German (however broken) I always got a response in German itself. In fact Germans more than appreciated me a foreigner taking an effort to talk in their language. Surprisingly, most Germans that I met felt that German is a difficult language to learn. But its true when it came to German friends.. They always spoke in English. It could be my sheer fear of being embarrassed speaking bad German that even I gave in talking to them in English instead. I’ve lived in Germany for 2 years and my experience is completely the opposite! Even university educated people have difficuly speaking English. When living in a foreign country one should try to speak the host language, but it is nice to get some help when needed (e.g. at the doctor’s) and that did not happen to me. I lived in Hannover and worked in Kassel and I believe that Berlin is a very different place to the rest of Germany. Now I live in Geneva and try to attempt to speak French and that is much more appreciated than speaking German was in Germany. I lived in Bavaria for about a year and a half and initially I had the same problem. I had to explain that I was there to improve my German so asked could they speak to me in German instead of English, after that explanation, I had no problem. Ironically enough my flatmate, who was the first person I used that line to, invited me to his home village to his friend’s birthday, which, no exaggeration, was in a barn in very rural Bavaria. Even there straight away it was English English English until I explained to them again. @Dave Hah! All right, so I’m wrong about Bavaria…good to know! First of all, I must say in MY experience, the stories of Germans, Swedes or Danes speaking impeccable English have proven to be false. Certainly, they speak more and better English than people of other nationalities. However, most of the people from – insert above countries – I’ve met are heavily accented and have a poor command of proper grammar when speaking, more often than not “translating” their own expressions into English, rather than using the appropriate ones. Do I blame them?! Heck, no!!! My Swedish must sound equally foreign and funny, not to mention my Danish now I’ve lost practice. When living in Denmark – Copenhagen to be precise – I didn’t find much resistance to using Danish on a daily basis. My theories as to why: a) Some people I talked to where somewhat “ashamed” of their not perfect English and thus disguised this behind the “we’re in Denmark; we speak Danish” facade and, b) Some people were actually impressed(?) with my willingness to learn the language and thus pleased to help me with my endeavor. Sweden (Stockholm) was more less the same so, all in all, I was able to inhale much of the language through normal every day conversation, rather than organized learning. Keep on exploring this “thing” called languages. I, for one, really enjoy your humor-soaked insights. I was just discussing this topic with a German friend (in German of course) on Saturday. It drives me mad. My German is fluent but still they insist on speaking English to me. There are plenty of tourists who have no German so why insist on speaking English to me. I have tried persevering and replying to their questions in German. Sometimes it works and sometimes it doesn’t. i do not speak German but I am fluent in Japanese. When I travel to Japan people often answer back in English or, even though they hear me speak their language with no problem they say “oh, sorry, no English”. I particularly find this funny. Hello, I live in the east of Germany, in a city called Dresden in the south of Berlin. I’m traveling a lot through Europe, and people often are suprised, and allways tell me, that I speak a nearly perfect English, even tho I learned it by myself during this travels. But if someone starts to talk to me in german, I allways answer in german. Yes sometimes you switch to english if the other one has problems or don’t understand you, but if someone really wanna learn it, practice while talking german to a native, then I’m open to that and like to help. I’m often impressed, how people from other countries are able to learn our language. I wish I’d be that good and fast sometimes. This comic is so true! I had great results by talking to people over 40 years of age. I used them to hone some of my skills. They often seemed to find it charming that someone wanted to learn and speak German. Younger folks just politely smiled and wanted to speak in English. I tell them that I am from New Zealand, where we speak Hobbit and Maori and that English is a foreign language. That happened to me all the time in Barcelona when I wanted to practice my Spanish, so upsetting! I went to a gymnasium in Bavaria when I was younger and everybody was so excited to practice their English with me, but right from the start, I just pretended I didn’t speak English. I told them I didn’t speak English and that I just spoke German very poorly and they laughed and thought I was joking, but I really persisted and they got the point. That being said, I miraculously remembered how to speak English whenever we were in English class, an inconsistency I attributed to the outstanding skills of our English teacher. I think it’s easier that way. If you make your expectations clear from the beginning, you won’t have to struggle nearly as much. I have been in Berlin for almost 3 years and I barely speak English. Most of my German friends always speak German and love to correct my german every time I make mistakes. Having travelled to Germany multiple times and seen Germans interviewed on television speaking Engish, I have a question. Some appear to speak Engish with a British accent and some with an American accent. How do they determine which English accent they determine with which accent to speak English? But those of them who speak English well enough to have an English or American accent have usually spent years living and studying and/or working in an anglophone country. So they have the accent of whichever country they went to. While it’s true that usually the English taught in German schools is British English, I wouldn’t say if you learned English only in a school you’d be good enough to have a British accent. Well that’s weird – I live in Aachen (~250k population, IIRC) and most of the German people I know won’t even watch movies or TV shows in the original English, instead preferring (badly) dubbed German versions because otherwise, frankly, they’ll miss half the dialogue. It’s different when they’re speaking to someone who doesn’t have a very good grasp of the German language, because they’ll make a bit more of an effort in that case, but in day-to-day life, I’d go as far as to say that they actively avoid hearing or reading anything at all in English. Same thing when I learned Spanish from my Puerto Rican patients in NYC. They loved it when I spoke Spanish. (And same thing happened when I moved my practice to California — and spoke Spanish to the Mexican crop pickers. Bottom line: today everything’s different — I spend a lot of time reading stuff on Russia Today — all in English. And whenever I run into Germans here in the States they speak English with almost no accent. Explanation for all this: 1) American victory in WW2, and 2) especially American TV during the ’60s thru the ’90s finally has brought to the entire world, for the first time, A UNIVERSAL LANGUAGE. —- Too bad we Yankees have also brought to the world such a low level of humor, personal values, and economic honesty. Anyway — Chou, widrluege mitenand, Luego — etc. etc. @Bill Schenker I agree. My dad’s German, my mother met him and learned the language in Germany in the 70s, and she says she never had any problem with people speaking English back to her. These days, it’s hard for Europeans NOT to learn English. Malachi, I totally get your frustration. A number of comments focus on making your needs and wishes clear from the outset. “Ich bin hier um mein Deutsch zu verbessern.” Sometimes I try a more inviting “Sie können ruhig mit mir deutsch” first. If you are a German, it is nearly unavoidable to learn English. I started learning English at school at the age of eight and there are a lot people who start even earlier. Good written and spoken English is a requirement for lots of jobs here since you get in contact with English nearly everywhere. English is also part of the daily life – many advertisements use English slogans, people listen to English music, cafés are given English names etc. Many people also read English books and watch English series (maybe mainly because the dubbing is often horrible). The accent is a funny questions. Schools usually teach British English but often both (English and American English) is accepted. I found it quite funny that British people told me I would sound American but I was also happy because I obviously don’t sound German. However, I really don’t have a clue why I speak a little like an American since I have been in England three times but never in America. Maybe it’s because of the American series I like to watch. I talk in English to English people because I love this language but that might be just me. You maybe can’t say something about this in general. By the way: I know this problem too. When I was in Spain (I can speak little Spanish) everyone just talked English or German to me and I could not practise my Spanish. I will come Berlin, Germany in December for my Masters but I am mentally very disturb because of language barrier ..Can any one guide me and tell the ground realities ? @Rameez If you speak any English or German, you’ll be fine! Hello friends ! I’m moving Germany soon ,I’m fluent in English, do I feel language difficulty living in Germany? @natasha That depends. Where in Germany are you moving, and what will you be doing? I speak multiple languages; British English, Irish Gaelic, Finnish, French Canadian and I’m currently studying German. I was just wondering what British English sounds like to German speakers. Most of them I speak to *in* English seem confused where the words start and end. I don’t speak chav, I speak proper British. I don’t know if there’s an easier way to speak to Germans in English, though I’ve emulated American English and they seem to understand it a bit better. I’m moving to Germany and extremely new to German. It’s sort of a worry of mine that no one will even understand my English. In my experience in speaking with Germans of multiple ages, educational backgrounds and social classes, the level of English is highly overrated. Some obviously speak it better than others, but to say that most would speak “near perfect English” is very much untrue. Really what helped the most was having actual practice sessions where the goal was to specifically practice my spoken German (i.e., not walking up to random people and try to use an everyday conversation as practice time). I couldn’t tell you when I improved, but I really don’t have an issue with Germans speaking German with me–and keep in mind, I live in the U.S., so it wouldn’t be out of line for them to insist on speaking English. The reality is that not everyone loves learning languages, and most people seem to be willing to tolerate my imperfect but comprehensible German instead of switching into what is still their foreign language mode. Wow this is near exact to my 2-week abroad course in Germany. I guess even though we were placed in some tiny town, we were actually close enough to Salzburg that nearly everyone spoke English. Many of the students were taking English AND a third language in school. Impressive, for sure. Terrible for trying to practice my German though, since they insisted on not speaking it to me. do english language spoken in germany? I generally think Germans are really good at learning other languages and get pretty good at it. My first boss was German and boy could she speak the ethnic languages in our country. I know a little german but can never bring myself to practice speaking to a native speaker for fear of embarrassing myself.